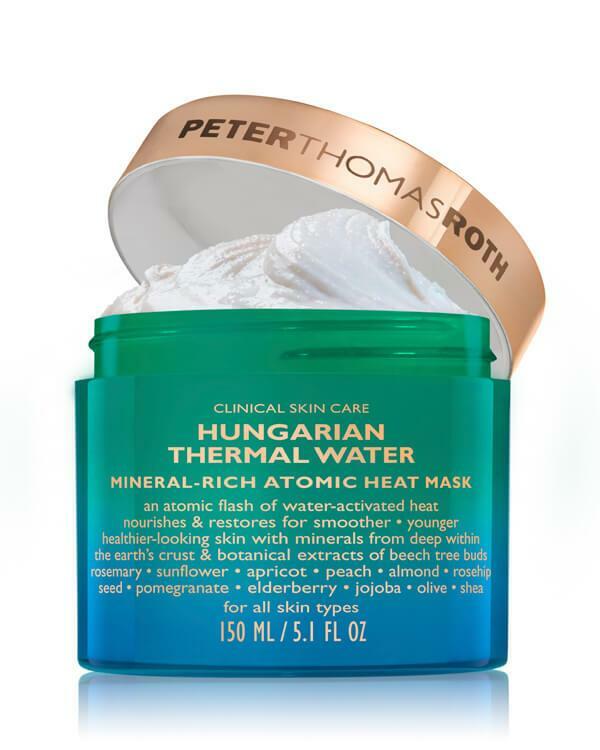 Meet the latest mask by Peter Thomas Roth: the Hungarian Thermal Water Mineral-Rich Atomic Heat Mask! This fountain of youth mask harnesses the power of Hungarian thermal water, botanicals and modern technologies. For years, people came from afar to soak in the mineral-rich, fountain of youth thermal waters of the Hungarian spas owned by Peter’s grandparents. Today, Peter Thomas Roth uses the most mineral-rich thermal water on earth from a secret spring deep below Hungary’s Carpathian Valley, where the earth’s crust is the thinnest; allowing water to absorb the most minerals as it bubbles to the surface. Rich and luxurious, this hydrating mask transforms with cool water into an invigorating flash of heat to open pores and optimize nutrient absorption. Infused with natural Hungarian botanicals of Sunflower, Apricot, Peach, Rosehip Seed, Almond, Pomegranate, Elderberry, Jojoba, Olive and Shea extracts, and bioengineered botanicals Gatuline® RC (from Beech Tree Buds) and Merospheres-V (from Rosemary). Helps reduce the look of fine lines, wrinkles, dullness, uneven skin tone and texture for smoother, healthier and younger-looking skin. The Hungarian Thermal Water Mineral-Rich Atomic Heat Mask from Peter Thomas Roth contains the following ingredients: Magnesium Sulfate, Butyrospermum Parkii (Shea) Butter, Butylene Glycol, Dimethicone, Shea Butter Glycerides, Caprylic/Capric Triglyceride, Ceteareth-20, Kaolin, Zeolite, Helianthus Annuus (Sunflower) Seed Oil, Prunus Armeniaca (Apricot) Kernel Oil, Prunus Persica (Peach) Kernel Oil, Rosa Moschata Seed Oil, Prunus Amygdalus Dulcis (Sweet Almond) Oil, Simmondsia Chinensis (Jojoba) Seed Oil, Glycine Soja (Soybean) Oil, Honey (Mel), Elaeis Guineensis (Palm) Butter, Punica Granatum Fruit Juice, Fagus Sylvatica Bud Extract, Sambucus Nigra Fruit Extract, Rosmarinus Officinalis (Rosemary) Leaf Extract, Tocopherol, Glycerin, Illite, Squalane, Hydrogenated Vegetable Oil, Lecithin, Ethylhexyl Palmitate, Dipropylene Glycol, Dimethicone/Peg-10/15 Crosspolymer, Polysilicone-11, Lauryl Peg-9 Polydimethylsiloxyethyl Dimethicone, Water/Aqua/Eau, Ethoxydiglycol, Propylene Glycol, Sodium Citrate, Benzyl Alcohol, Benzoic Acid, Sodium Benzoate, Potassium Sorbate, Phenoxyethanol.